As your business grows, it gets harder to ensure that processes stay on track. In customer service, this is bad news for the predictability, consistency, and timeliness that your customers are used to. This is where Blueprint comes to the rescue. Every process is important, so it shouldn't be hard to design or to follow. 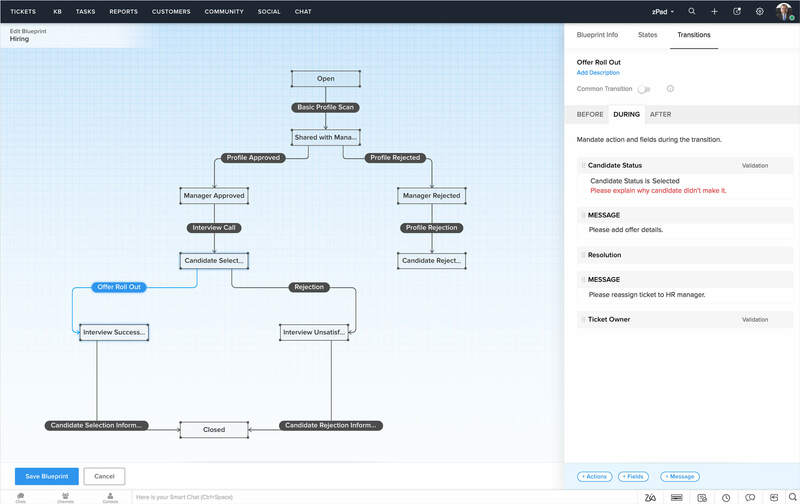 Zoho Desk's drag-and-drop Blueprint Builder lets you assemble sequences of actions visually. When triggered, every step of the Blueprint is followed, just the way you intended. Every business has unique ways of getting things done. 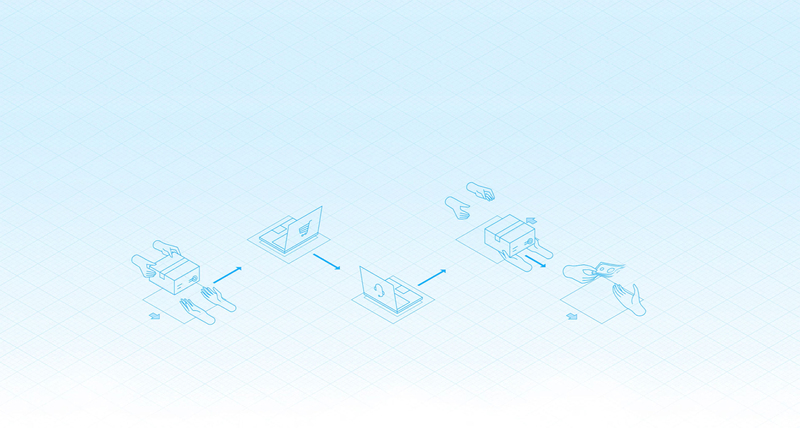 That's why Blueprint lets you customize every detail of every process you design, down to the last action. 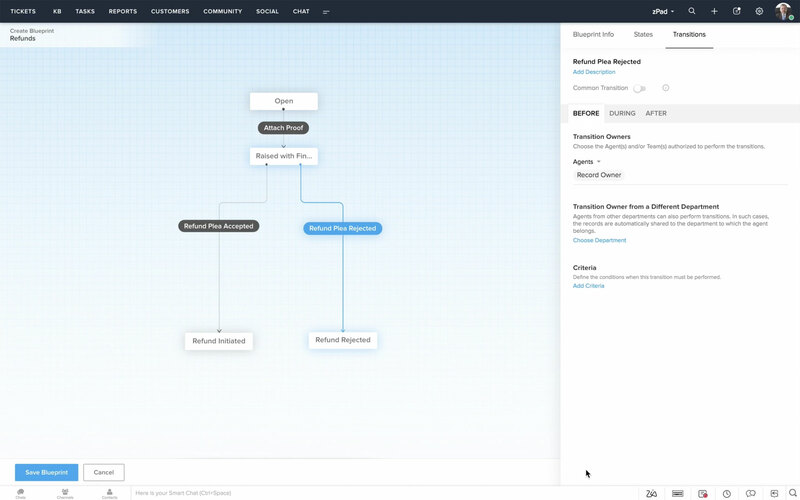 Be it a specific condition that needs to be met, or a custom notification sent out, Blueprint lets you do it all. Multiple employees or teams can be a part of the same Blueprint, without the need for intervention or supervision. Bottlenecks are easier to spot and fix because Blueprint clearly defines the who, what and when of every action. Every time you get a new hire, they'll need to learn your processes. Don't worry about explaining them yourself. Blueprint will. As every Blueprint gently nudges new agents through actions, there's no time lost in onboarding. At every stage of the process, Blueprint makes it easy for every stakeholder to adhere to the process. They only see the actions applicable to them and cannot move forward unless all their mandatory actions are completed. 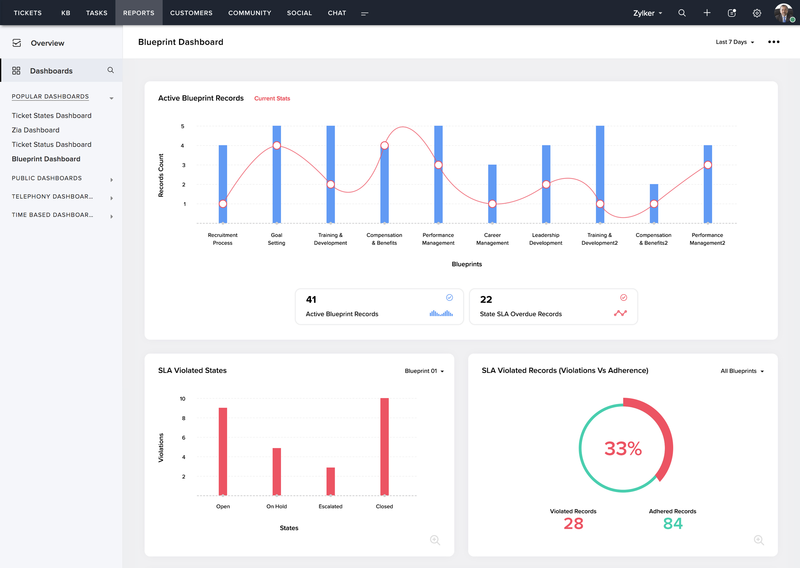 The Blueprint dashboard helps decision-makers see how many tickets are in each stage of a blueprint, how many tickets have gone past their SLA, which states violate SLA the most, and other related metrics. This helps catch bottlenecks and make refinements to the process to address them. Wait, how's this different from a Workflow? 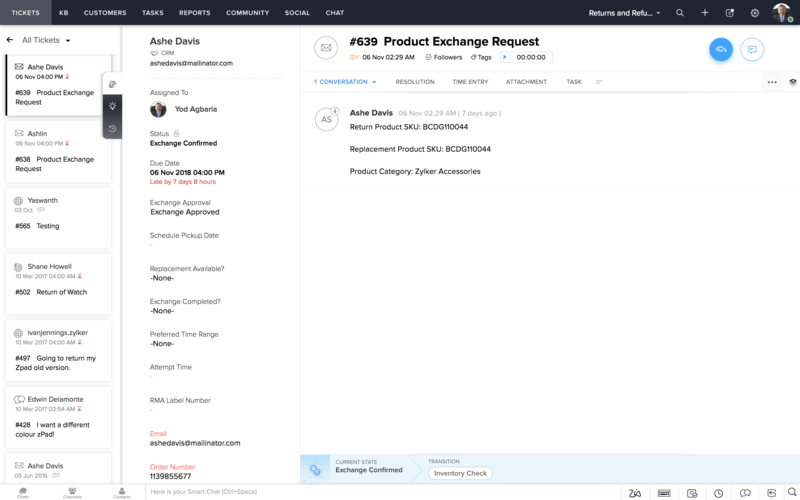 Workflows automate email alerts, task assignments, and field updates when a certain rule is triggered. On the other hand, a Blueprint mandates an entire sequence of actions, taking tickets from state to state until they're resolved. Unlike a workflow, a blueprint defines all the actions that happen to a ticket until it's resolved. 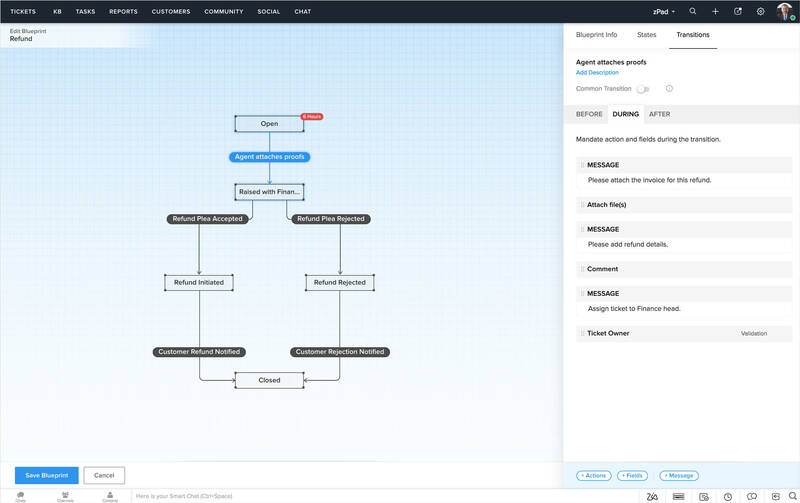 Don't just make workflows, make work flow.